Apple has just announced their third generation iPad, the iPad 3 which they simply call the ‘New iPad’, and the iPad 3comes with a range of new specifications over the iPad 2, which include a new high resolution display which features a resolution of 2048 x 1536 pixels, plus it now comes with 4G LTE, it is time to compare the iPad 3 vs iPad 2. The iPad HD also comes with a more powerful processor than the iPad 2, it now features an A5x processor with quad core graphics, and it also features a new iSight 5 megapixel backside illuminated camera which is capable of recording full high definition video in 1080p. 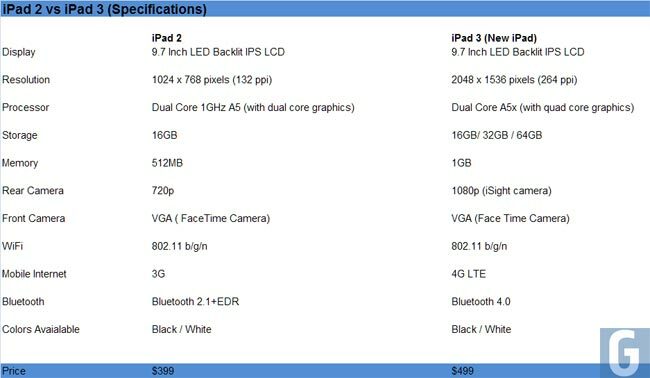 Have a look at our comparison below which shows the specifications of the iPad 2, (which is now Apple’s budget tablet that retails for $399, as opposed to the $499 price tag on the iPad 3. As you can see from the table the iPad 2 is now only available with 16GB of storage in both WiFi and WiFi and 3G models, where as the iPad 3 is available in 16GB, 32GB and 64GB in the WiFi only model and the WiFi and 4G model. 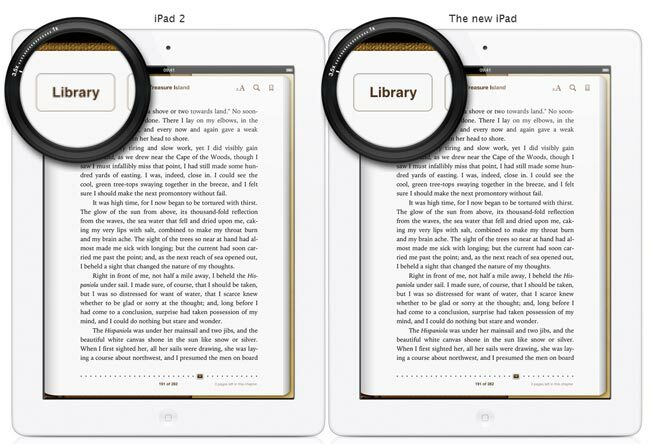 As soon as we have managed to get our hands on the new iPad HD we will update the article and let you guys know how the two tablets compare, you can find out more details about the new iPad 3 over at Apple.